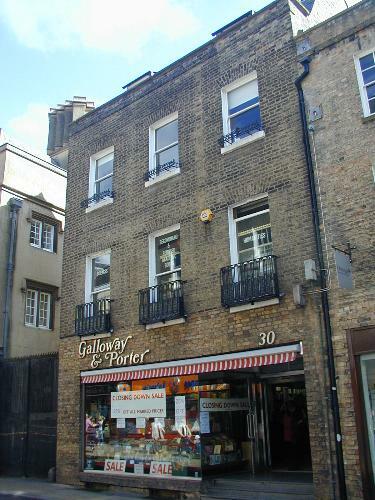 The building is of no consequence, but the business inside, Galloway and Porter, was a Cambridge fixture. It was founded in 1902 and the Porter family took over completely after Galloway left the business two years later. The firm even published some of its own books, at least up until the late 1950s. Already by the 1980s a large part of their business was selling "damaged" Cambridge University Press and Oxford University Press books, and by the 2000s they had completely moved to selling remaindered books, because of competition from Amazon and the like in the new book market. They also had regular 1 and 2 pound per book sales in their Cherry Hinton Road warehouse. In 2008 the Porter family, like the Heffer family beforehand, sold up the business. In April 2010 the business went into administration. It closed its doors for the last time on 31 May 2010.